South Dakota is an expansive, sparsely populated midwestern state where rolling prairies give way to the dramatic Black Hills National Forest. Whether traveling for a luxury vacation, business, or special event, our jet charter team can arrange a luxury jet to/from any travel destination in South Dakota and neighboring states. Fly private with our South Dakota private jet charter service and arrive in style for your next trip! Fly privately into one of the following destinations within South Dakota. This list of destinations is based on Air Charter Advisors clientele requests, local attractions, and online reviews. Many of our clientele choose Sioux Falls and Rapid City as their top travel destinations when planning a trip to South Dakota. Black Hills is home to 2 historical monuments carved right into towering granite peaks: Mt. 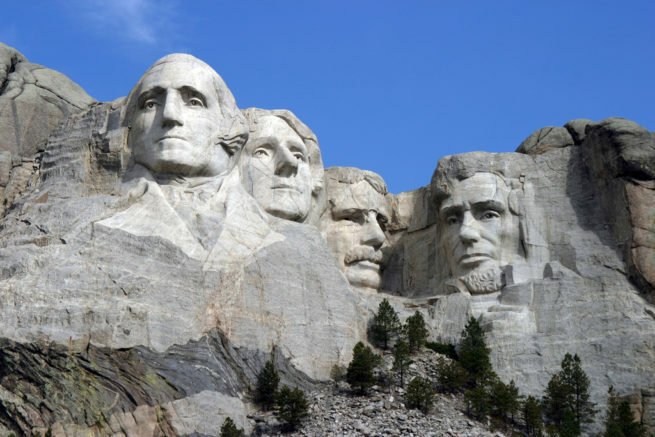 Rushmore, the iconic depiction of 4 revered U.S. presidents, and Crazy Horse Memorial, a tribute to the storied Native American tribal leader. Request a Quote or give us a call at 1-888-987-5387 to speak with one of our South Dakota private jet charter brokers for your next luxury vacation, business trip, or special event.